The Lammas Festival at the beginning of August is one of the four Celtic Cross Quarter Festivals, linked to the old farming calendar – some call it Lughnasadh. This festival comes from a time when people were very close to the land; their lives were governed by the changing of the seasons, and the need to grow enough food to survive. Lammas takes its name from ‘hlaf maesse’, the Old English for ‘loaf mass’, and this is the time when the cereal crops are harvested. There are links to other cultures and religions too, notably Demeter and Ceres, also associated with crops and the harvest. 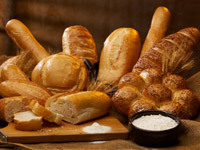 There are many ancient customs involving the cutting of the first and last sheaf. The spirit of the corn, sometimes referred to as the Corn Mother, was the sacred symbol of this festival. Many cultures, including the Ancient Greeks, Romans and Egyptians, held similar types of rituals where the bounty of the land was honoured. 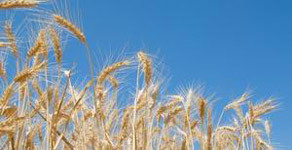 It was also the time when John Barleycorn was sacrificed. Corn dollies are a feature of the Lammas festival, and in times past, different regions wove their own beautifully complex designs, often decorated with bright ribbons or wool. Traditionally, the corn dollies woven at Lammas (or their ashes) were ploughed back into the land at Imbolc, thus symbolising the return of the Corn Spirit to the earth, in an attempt to ensure a good crop the next year. 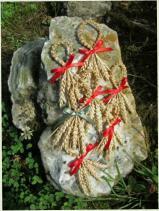 Lammas is also the time of year when sweethearts exchanged favours – these were simple knots woven from corn and sometimes tied with a ribbon. If a girl accepted a boy’s favour, she’d pin it to her clothing to show the community she was ‘walking out’ with a lad, and he’d pin her favour to his hat to do the same. 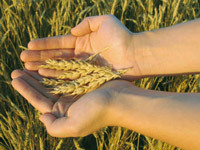 The symbol at Stonewylde for Lammas is the head of wheat or corn. It’s a full day of celebrations for the folk of Stonewylde, but particularly the Villagers. Rituals start before dawn up in the Lammas Field, with the community spread around the perimeter and linked together to greet the sunrise. The crop is harvested in this one special field in the traditional way using sickles. 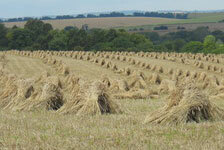 Every man, woman and child from the Village is involved with harvesting the Lammas Field in time-honoured fashion. Lammas cakes are eaten for breakfast, made from corn, butter and honey and flavoured with nutmeg. This is the day for honouring the Corn Mother, the symbolic spirit who lives in the crops and sacrifices herself every year for the community. When the last sheaf from this field is harvested, it’s carried ceremoniously to Magus and the Lammas Queen. She must weave it into a special corn dolly to be used in the rituals up at the Stone Circle that night. It’s then hidden up in the rafters in the Great Barn, to protect the Corn Spirit during the cold winter months. At Imbolc, the dolly is fetched down again for the Corn Spirit to be returned to the waiting earth in the Lammas Field. There’s also another custom that takes place when the last sheaf is cut – the killing of the many rabbits trapped in the centre of the field, which are made into special Lammas pies for supper. No place for squeamishness in the countryside! 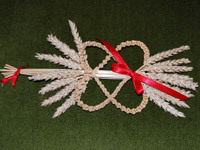 Information about the ancient craft of corn-dolly making can be found on the website of the Guild of Straw Craftsmen. Many Stonewylde readers have memories of making simple corn favours at school, but generally it’s not a craft that’s taught to children nowadays. There’s also a serious shortage of the old-fashioned type of crop needed to make corn dollies – it must be the hollow-stemmed variety which isn’t widely grown any more. Members of the Guild of Strawcraftsmen are dedicated to keeping the craft alive, and run workshops and demonstrations for interested parties. You can read all about the Lammas festivities in the second book, Moondance of Stonewylde. Lammas is a good time to remember that we’re all dependent on the bounty of the earth. Without the fertility of the land, and the life-giving powers of the sun and the rain, there’d be no living creatures on this planet. Take time at Lammas to honour Nature’s gifts to us.